Cutting-edge, superb-quality optics with all the bells and whistles. More than any other genre of shooting gear, riflescopes are undergoing a revolution in design. Precision shooters of 15 years ago didn't even dream of the features, quality, and capability that todays top scopes provide. Driven by the tidal-wave popularity of precision and shooting, these engineering advancements have brought unprecedented levels of capability to a broad swath of shooters. Plus, there's a tremendous variety. How to choose? This list isn't billed as THE top long-range scopes available. Rather, it's a list of very, very good scopes, all of which will perform yeoman's duty. If we've left your favorite out, let us know- and be sure to share just why you think it's superior to these. All the optics included here are waterproof, shock resistant to extremes, and nitrogen or argon purged against internal fogging. They wouldn't be included if they weren't. Let's just get that out of the way up front. Enough verbal lather. Here, in alphabetical order, are seven of the finest long-range scopes on the market. Who'd a' thunk it? We're starting the list with a Bushnell. Not just any Bushnell; this precision optic will play with the big dogs- and often dominate. Extraordinarily tough and packed with outstanding features, the XRS II ain't your granddaddy's Bushnell. Note the vast magnification range. Observe the superb turrets, and intriguing array of available colors. Several capable Front Focal Plane (FFP) reticles are available in both MIL and MOA. Lenses are crafted of ED Prime glass, fully multicoated against refraction and color fringing, and provide distortion-free clarity and excellent light transmission. Multi-rotation turrets provide 10 MILs of adjustment per rotation and are fit with a zero-stop type mechanism. Price: $3,290. Weight: 38 ounces. Length: 14.5 inches. Tube: 34mm. For several years, this European company has been creeping up the popularity ranks among PRS shooters, and in 2017 scored second only to the Vortex Razor HD Gen II among the top-100 ranked competitors. For 2018, Kahles (properly pronounced Kah-less) announced a refined precision scope touted to combine space-age features with "maximum optical performance." Likely, it delivers. You can pick right- or left-side windage turret placement. Parallax is integrated into the Elevation turret. FFP reticles are illuminated. The gears in its guts are a marvel of repeatable precision. Pick MOA or MILS. Zero stop is standard. And naturally, being German, the glass is second to none. Price: $3,666. Weight: 34 ounces. Length: 14.8 inches. Tube: 34mm. This is arguably the most exciting precision scope to come down Leupold's pipeline in, well, ever. Not only does it sport an incredibly well thought out array of cutting-edge features, at 30 ounces it's the lightest of its type. (Its 3-18x 44mm little brother is only 26 ounces.) Featuring a zero stop/zero lock on its well-engineered, multi-rotation elevation turret, included compact power ring throw lever, and a vast adjustment range (34.9 MILs/120 MOA) and your choice of several leading FFP reticles in MIL and MOA, it's an optic to bet on. In addition to above-par mechanics, the Mark 5HD provides superb light transmission, clarity, color purity, and is entirely lacking distortion. Price: $2,600. Weight: 30 ounces. Length: 15.7 inches. Tube: 35mm. This superlative optics company engineered and built outstanding long-range scopes with all the bells and whistles before most companies even remotely conceptualized such optics. The ATACR is a flagship workhorse, seen wherever savvy long-range cognoscenti gather. Side-focus parallax adjustment, multi-rotation turret with zero stop, power throw lever, locking diopter, the ATACR has it all. To boot, Nightforce scopes have a reputation for indestructible, consistent internals, which translates into precise, predictable, reliable adjustments when constantly dialing for various distances. Several notable FFP reticles are available in MIL and MOA. As for glass, just look through one. Pure colors, no distortion, and light flows like beer at a German party. Price: $2,600 to $3,000. Weight: 38 oz. Length: 15.4 in. Tube: 34mm. Without question, this is the single most innovative scope available. Basically, it's got a super-capable on-board Bluetooth-compatible ballistic calculator and on-board atmospheric reader that rivals your favorite Kestrel. Plus, it measures incline. It combines all these variables to calculate an exact ballistic solution in real-time, local air densities and shot angle. Plus, an electronic simulated spirit level helps you avoid canting your rifle. Yep, it's a smart scope. Once programmed with the ballistics of your particular rifle, cartridge and projectile, all that's left is to range, aim, and dial while viewing the target through the scope. An LED display inside the scope reads real-time turret range adjustment. Simply dial to the actual range, breathe, and squeeze. Light transmission is good. Clarity is excellent. Magnification range is vast. And amazingly, the Revic is priced lower than many of the other scopes here. Price: $2,750. Weight: 47 ounces. Length: 14 inches. Tube: 34mm. A couple years ago I went to the Steiner manufacturing facility in Colorado, where I completely assembled a T5Xi 5-25x 56mm scope, put it through all test and QC protocol, and then spend two days training with it under the tutelage of highly-ranked pro PRS shooter Andy Reinhart. I know this scope better than any other- literally inside and out- and I love it. The glass is incredible. Low-light performance is stellar. Color purity is sterling. Distortion? What distortion? New for 2018, an MOA reticle has been added to the lineup, and of course it's available with a capable FFP MIL reticle. The multi-rotation, zero-stop-equipped elevation turret has a cutting-edge second-rotation set of numbers. A rheostat for the illuminated reticle piggybacks atop the side parallax focus. 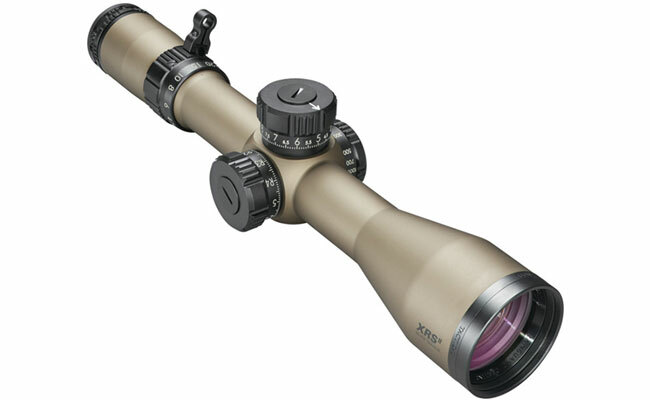 In all, it's a superbly designed optic that will go the distance and breeze through any precision shooting task. Surveys show that this specific scope is used by 36 to 40 percent of the top-ranked 100 PRS shooters each year. That's a resounding accolade. Paul Dallin, a friend amongst those top-tier competitors, says it's due to this: The Razor HD Gen II is a capable optic, with a street price of "only" about $2,200, and carries the best warranty service in the business. It's pretty hard to argue with that. Good glass, outstanding features and ergonomics, tomahawk-like reliability, and Swiss-watch precision make the Razor HD Gen II a force to be reckoned with. Both MIL and MOA etched-glass FFP reticles provide options; a massive 28.5 MILs of internal adjustment will go any practical distance, and a zero stop and multiple-rotation numbers keep you on track. Price: $3,400. Weight: 48 ounces. Length: 14.4 inches. Tube: 34mm.